The 2018 Alfa Romeo 4C is powered by a 1.8L turbocharged 4-cylinder engine mounted behind the cockpit. The engine produces 237 horsepower and 258 pound-feet of torque. While that may seem rather modest for a sports car of this caliber, Alfa Romeo claims that the 4C is still capable of 0-60 times in about 4.5 seconds, with a top speed of 160 mph. The only transmission available is a 6-speed dual-clutch automatic with paddle shifters. The 4C utilizes various exotic construction techniques, including a structure composed of carbon fiber and aluminum as well as composite body panels. The engine is an all-aluminum design and as a result, the car's total weight is kept down to about 2,000 pounds. The 4C tends to eschew luxury features in its quest to keep weight down, but there are limits to this philosophy, and the 4C still comes equipped with powered windows and mirrors, air conditioning, a 7-inch thin-film transistor instrument cluster with a lateral acceleration G-meter and a 4-speaker sound system with USB and audio input jacks. Options include bi-xenon headlights, a front fascia with carbon fiber bents, a carbon fiber spoiler, carbon fiber and leather interior accents, bigger wheels, leather seating, leather steering wheel and a commemorative plaque. Additionally, there are several option packages available on the 4C. A Convenience Package adds cruise control, an alarm and parking sensors, while a Leather Package includes leather seating and contrasting stitching. 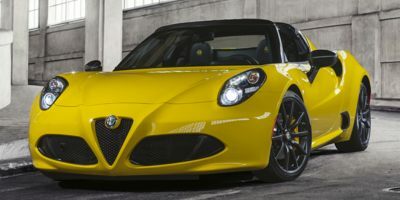 For 2019 Alfa Romeo drops the coupe variant of the 4C leaving behind only the Spider. Features formerly included in the Track Package such as sport-tuned suspension, Italian flag mirrors and a leather wrapped steering wheel now are offered as stand-alone options. Advanced parking sensors and cruise control are now standard equipment. The Alfa Romeo 4C coupe starts at a base price of $55,900, while the 4C Spider starts at $65,900. Both cars compete with sports cars like the Porsche Cayman and Boxster, as well as the Chevrolet Corvette. Rather than try to outmuscle its competitors, Alfa Romeo has instead opted for an approach centered on finesse and balance. With its ultra-lightweight carbon fiber monocoque construction, the 4C is among the lightest cars sold in the United States. The mid-engine design and well-balanced approach means it's an excellent handler and one of the best-looking sports cars available.